The perfect addition to your Easter decor. 1. Gather your material. 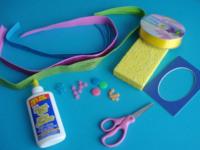 You will need a sponge, ribbon, a picture frame passepartout with an oval center, pastel necklace beads, white glue and/or hot glue, and Fun Foam strips. 2. 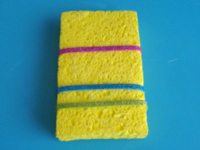 Place the sponge vertically in front of you. Glue the Fun Foam strips on the sponge horizontally. 3. 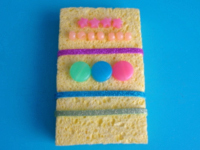 Glue the necklace beads on your sponge in horizontal rows as shown. 4. 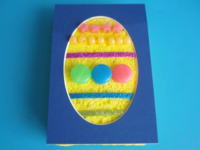 Glue the picture frame passepartout on the sponge to see an Easter egg appear. 5. Cut three pieces of ribbon. You will need two long pieces and a shorter one. 6. 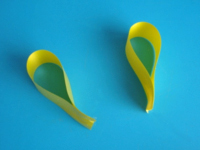 With the two longer pieces of ribbon, create loops as shown. 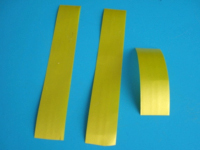 Use glue to stick the ends of each piece of ribbon together. 7. Position both loops one on top of the other, end to end. 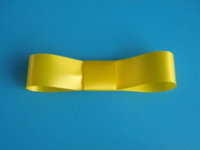 Wrap the shorter piece of ribbon around the centre vertically to create a bow. Glue it in place. 8. 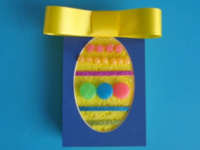 Stick the bow above your Easter egg. 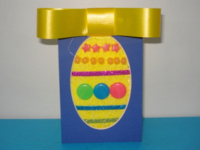 Display your Easter egg trinket on a shelf.